The PAR20, PAR30 and PAR38 lamps deliver 520, 800 and 1,200 lumens respectively, and are intended to replace 50-, 75- and 120-watt incandescent and halogen floodlights. The lamps are available with light at a 3,000-degrees-Kelvin, warm, incandescent light temperature, as well as two cooler types of light — 4,000 Kelvin, cool white, and 5,000-Kelvin, near-daylight. The LED PAR lamps offer the same form factor and beam pattern as the PAR lamps that they are replacing. The company said the lamps design has an integral cooling system that reduces stress on fixture components for longer life. And they offer dimming technology to less than 5 percent on standard controls applications, as well as wet location rating. The company said applications for the lamps could include art museums, retail display, hospitality, restaurant, long-term care and other architectural applications. 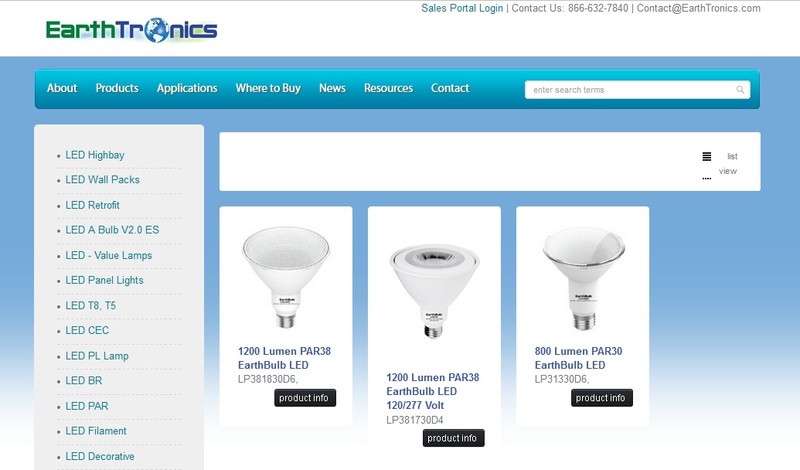 EarthBulb LED lamps are available at retailers nationwide and can be purchased online. For more information about EarthBulb PAR20, PAR30 and PAR38 EarthBulb LED floodlights, visit https://www.earthtronics.com.